The Outback Steakhouse menu is always improving and expanding. The folks at Outback know what we like and how to give us more of it. 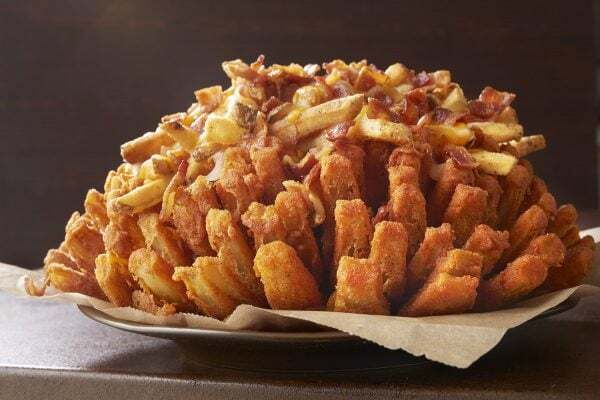 The highly anticipated Loaded Bloomin’ Onion is now available. Outback Steakhouse sponsored this post, but all opinions are my own. Two of the most famous appetizers on the Outback Steakhouse menu have “mate”d. See what I did there? That’s right, mates, you no longer have to face the difficult choice between a Bloomin’ Onion and Aussie Cheese Fries. Just order a Loaded Bloomin’ Onion and receive the two iconic appetizers in one. This indulgent new option is available on the “Big Australia” menu, which features bigger portions of Outback favorites plus some exciting new offerings. The limited time menu is available now through August 2nd. Now is the time to gather up some friends and family to plan some serious dinner outings. The “Big Australia” menu is designed for sharing. 18 oz. Center Cut Sirloin: Seasoned and seared to juicy perfection and served with a signature potato and choice of one freshly made side. 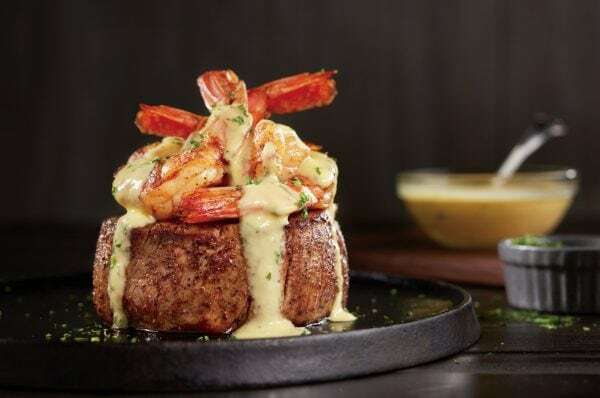 New Béarnaise Jumbo Shrimp Topped Filet: Victoria’s Filet Mignon topped with four jumbo shrimp and a Béarnaise sauce, served with a signature potato and choice of one freshly made side. New Giant Crab Stuffed Lobster Tail: Premium lump crab cake stuffed in an Aussie-sized jumbo lobster tail and topped with Hollandaise sauce. Served with your choice of two freshly made sides. The “Big Australia” menu is all about Aussie-sized portions, but there will still be a wide range of dishes to help meet other dietary needs, tastes, and occasions. The “Under 600 Calorie” appetizer and entree options include the delicious Crab and Avocado Stack, the 6 oz. Center Cut Sirloin with mixed vegetables, Grilled Chicken on the Barbie or Perfectly Grilled Salmon. Find an Outback near you, and stay social with them. Be sure to tweet @Outback to let them know your thoughts on the new menu. Don’t forget to use the Outback Steakhouse app to join the waitlist before you arrive, receive exclusive offers, and choose when and how you’d like to pay your bill. The dreaded choice between a Bloomin’ Onion and Aussie Cheese Fries is no longer an issue. Order a Loaded Bloomin’ Onion to make your whole table happy. The AUSSIE STEAK* TACOS sounds great! My goodness- everything looks so delicious. I have always loved Outback. I would definitely try the loaded bloomin’ onion and the Bearnaise Jumbo Shrimp Topped Filet! The jumbo shrimp topped steak. I see shrimp and steak together and I am a goner. Goodness everything looks delicious. I would love to try the New Giant Crab Stuffed Lobster Tail! The Outbacker burger looks great. I want to try the BEARNAISE JUMBO SHRIMP TOPPED FILET. BOURBON SALMON from the menu. I’d like to try the Sirloin. I want to try the Giant Crab Stuffed Lobster Tail. I ammost excited to try the New Béarnaise Jumbo Shrimp Topped Filet!! It looks yummy!! The grilled chicken on the Barbie sounds good to me. It all does! Thanks! I would love to try the Giant Crab Stuffed Lobster Tail. I MUST TRY the new Loaded Bloomin’ Onion! So excited. The loaded bloomin onion of course! I would like to try grilled chicken on the barbie. The Béarnaise Jumbo Shrimp Topped Filet looks great! The Bearnaise Jumbo Shrimp Topped Filet sounds amazing!! I would love to try it. I would like the Loaded Bloomin Onion & the Huge Chocolate Cake. Giant Crab Stuffed Lobster Tail is what I would like to try. The Giant Crab Stuffed Lobster Tail sounds irresistible and delicious! 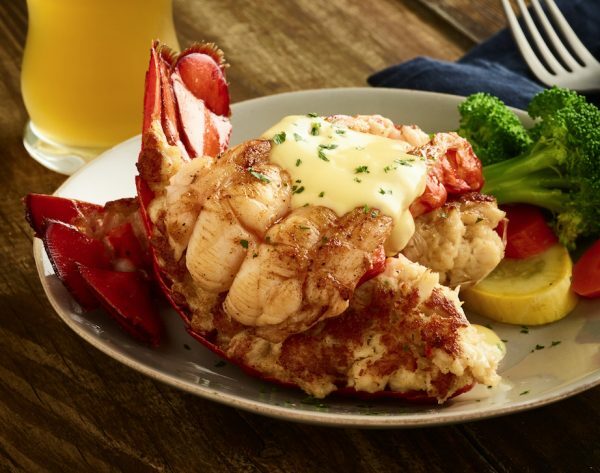 Ive never ate Lobster so I would love to try the New Giant Crab Stuffed Lobster Tail. Thanks for the chance to win. I want to try the Loaded Bloomin’ Onion. I would love to try the wood-fire shrimp on the Barbie. I would love to try the loaded bloomin’ Onion!!! All these new menu options look awesome!! 18 oz. Center Cut Sirloin definitely! I’m most excited to try the New Béarnaise Jumbo Shrimp Topped Filet! Giant Crab Stuffed Lobster Tail looks tasty! Béarnaise Jumbo Shrimp Topped Filet, filet mignon is my favorite. The loaded bloomin onion sounds amazing! I would love to try Giant Crab Stuffed Lobster Tail. The Béarnaise Jumbo Shrimp Topped Filet sounds and looks awesome! I have simple tastes so I would pick the Sirloin. Outback makes delicious steaks. I need a good steak. 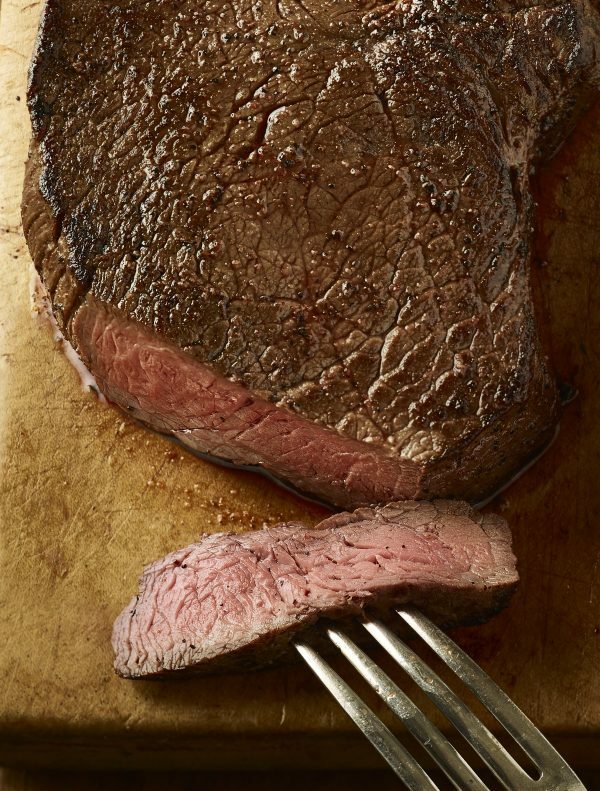 The HAND-CARVED ROASTED SIRLOIN sounds amazing! Can’t wait to try it! I want to try the JUMBO Shrimp Topped Filet! I love shrimp and I love steak and this looks amazing! I think the Giant Crab Stuffed Lobster Tail sounds so delicious! Also, you can never go wrong with their bloomin’ onion. Always one of my favorites! I’m excited about the Giant Crab Stuffed Lobster Tail!! I want to try the 18 Oz sirloin steak meal with a blooming onion and chocolate cake. My mouth is watering for that center cut sirloin and the Loaded Blooming Onion! I so need that meal, mate! The bacon bourbon salmon looks and sounds absolutely scrumptious. The bacon bourbon salmon sounds great to me. Crab stuffed steak – love crab!! I am most excited to try the Loaded Bloomin Onion. Thank you for the chance. The 18oz Center Cut Sirloin will have be Bloomin’ like a Blommin’ Oniom. I want to try that Giant Crab Stuffed Lobster Tail..YUM!! I am excited to try the new loaded bloomin onion. The new loaded bloomin onion!! I’m most excited to try the Giant Crab Stuffed Lobster Tail!. I love seafood. I am most excited to try their new Giant Crab Stuffed Lobster Tail. I love seafood! The item from the Big Australia menu I am most excited to try is : the 18 oz sirloin, yesss. Love big beef! Oh please give me the Giant Crab Stuffed Lobster Tail! I love Lobster and Crab!! Sounds mouthwatering. I’m drooling.. I definitely want to try the loaded bloomin onion, but also the New Béarnaise Jumbo Shrimp Topped Filet. I am excited to try the Bacon Bourbon Salmon from the new Big Australia menu at Outback Steakhouse. I would love to try the Giant Crab Stuffed Lobster Tail!